Matar Paneer Recipe Restaurant Style is popular and well known in India and abroad. 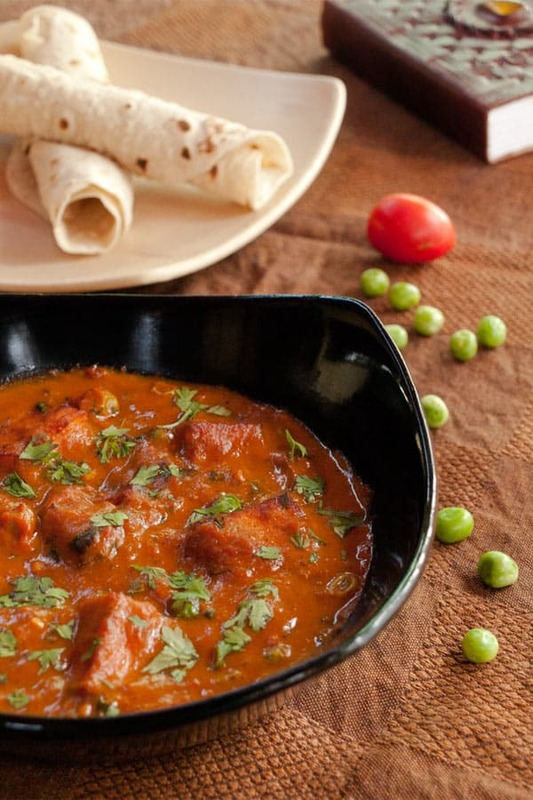 The curry recipe includes fresh Green Peas and soft Cottage Cheese cubes, cooked in a spiced gravy. The vegetarian Matar Paneer (Mutter) Recipe is Gluten- and Nut-free and freshly prepared from scratch. Learn how to prepare and cook the Matar Paneer Recipe Restaurant Style curry at home in less than 20 minutes with the step by step instructions further below. Here I was, sitting in the restaurant garden, looking at the gravy in front of me. My taste senses were not activated, in fact, the warm dish appeared rater uninspiring. “Another spice bomb disguised as a harmless dinner,” I thought. I hadn’t ordered, my husband was the culprit who left me with the food because somebody again timed well by calling him when he was about to attack his dinner. A common annoying occurrence in our lives. What was the gravy called? Mata Paneer? Mother Paneer? “Matar Panner!” exclaimed a friend. “Green Pease and Indian Cottage cheese in a sauce,” he said while answering the apparently obvious question in my eyes. How many times have I heard somebody say that in India? Each time when I would order something somewhere in this massive country, I would tell them “No spice, no Chillies, please (for god’s sake)”. Each and every single time I would be of course disappointed and the imagination of a heavy and happy tummy vanished with the first bite. Sometimes I wondered why people couldn’t see the fire coming out of my nostrils. How could they just swallow huge plates containing 90 % chili spice flavor? How!? The memories of previous food adventurous in the Indian subcontinent hadn’t subsided, sometimes they would even haunt me. So I couldn’t be blamed when I was ogling the obscure Matar Paneer, unclear if I should give the dish a chance and most importantly give the chef a chance who had conjured the plate of food. The gravy looked smooth, the Paneer bouncy, the peas looked like peas. The chef couldn’t be such a catastrophe after all! The fresh cow patterned chapatis were waiting at the side, still warm and ready to be torn, covered in gravy and to be devoured in one bite. I did that. Tore the Chapati into a food spoon, picked up a piece of Paneer with gravy and popped it into my mouth. Boy, I hadn’t expected what was to follow! A light tickling sensation of tomato goodness, spreading its flavor essence gently over my taste receptors. A surprisingly mellow spice experience that made me smile. I couldn’t believe what was happening, I loved the Matar Paneer and I didn’t mind the usually so rough coriander leaf aroma, no it was worse (or better?) I needed more of this gravy. I wanted to chew on a paneer piece again, experiencing the silent squeak of the cheese rubbing against my teeth. I wanted the flavors of the peas and tomato gravy combined and most importantly I wanted it all with the soft and partially crisp Chapati flatbread. Matar Paneer Recipe Restaurant style makes a great weeknight dinner for two. The Recipe is almost a one pot meal and can be prepared in less than 25 minutes. You won’t need a paste for the Matar Paneer Recipe as it is completely nut-free and the dish is not hot spicy. Try to use only fresh green peas and if possible fresh Paneer. Add the cottage cheese at the end of the curry preparation. Overcooked Paneer can crumble in the curry. The food coloring is optional and a common trait of restaurant style Matar Paneer. The Matar Paneer Recipe restaurant style is gluten- and nut-free. You will be able to prepare this easy classical Indian dish in less then 25 minutes and you won't need a paste. The food coloring is optional, the food coloring is very restaurant style. 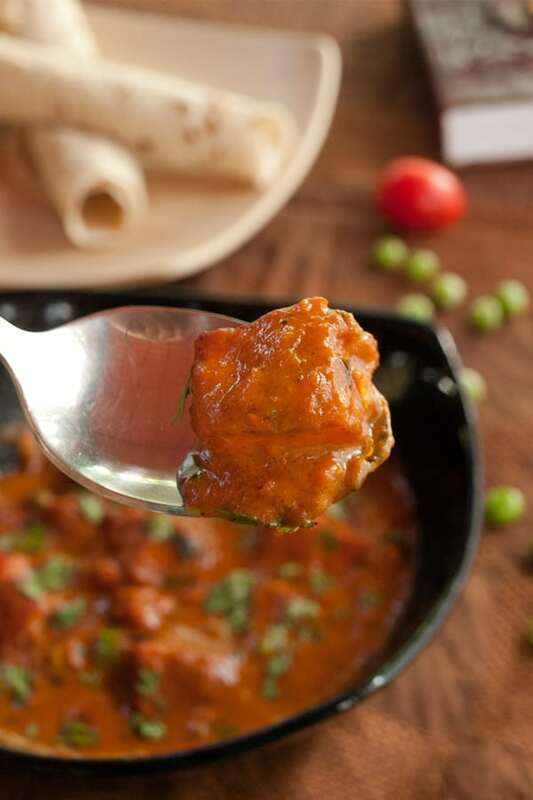 Also make sure to use fresh green peas and if possible fresh paneer (indian cottage cheese) as this defines the taste quality of this popular Indian spiced masala gravy. Serve hot with rice or chapati flatbread. Boil your Green Peas and keep aside. Heat up a pan, add the oil and stir fry your onion paste & ginger garlic paste for 2 minutes so that it cooks a bit and the ingredients start to emit the wonderful flavors. Continue to throw in the spices. turmeric powder, chilli powder, coriander seed powder, cumin seed powder, black pepper powder, garam masala, and dried fenugreek leafs. Stir cook the spices for a minute and then add the tomato paste, cream and the veg stock. Mix well. Let cook for 10 minutes on medium to slow heat and stir occasionaly. Then add in the paneer cubes and green peas and let cook for about 5 minutes on medium to low heat. Serve hot and garnish with coriander. Best enjoyed with rice or chapati. The food coloring is optional. Chefs in India love bright colored foods so they usually add lots of food colors into foods to make them appear more alluring. I leave the decision to you. Dear Reader, have you ever had a food enlightenment? 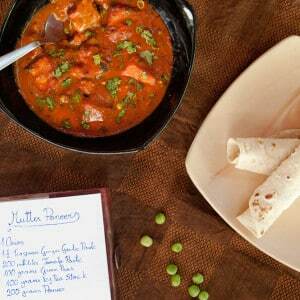 not all indian food is spicy or hot… hmmm like this mutter paneer. 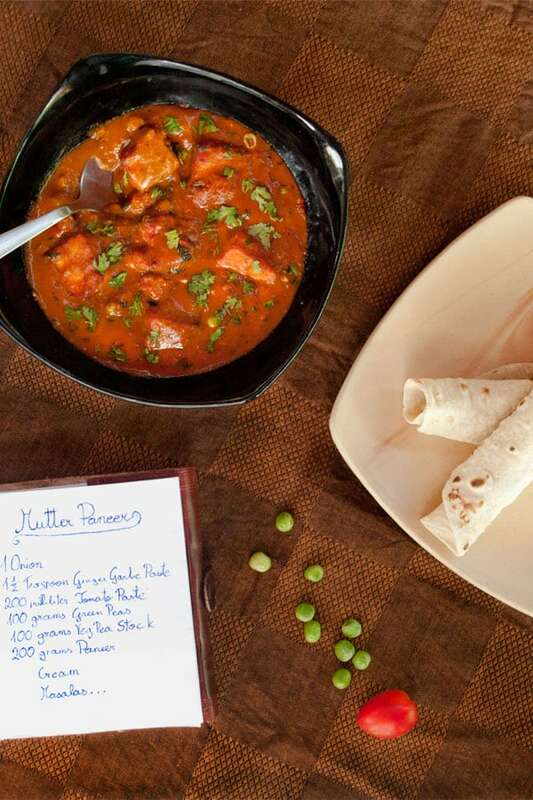 the mutter paneer and rotis are really looking restaurant style, especially with the red color. I love it Helene how you resisted it at first just to discover a world of flavors and sensations you like. You made me smile at the image of agonizing heat coming off Indian food. 🙂 I love the depth of color achieved in this dish and just by looking at it I know it is delicious! Looks like you made the real deal here though, looks sooo delicious! North Indian food is never as hot as food from south and west India, and you are sitting at a place that possibly serves one of the hottest cuisine of the counrty. Not that I am complaining, I LOVE hot food, especially Goanese. I agree with Minnie. You are in the hottest part of India. Not all Indian food is chilli hot and it’s unfortunate if that’s all you’ve had. If you are ever in Colorado, I will cook for you. My food is not chilli hot but its layered flavour with many spices. I am glad you liked the muttur paneer though, I love pea curries. Yours looks like the real deal. I love this dish! And you’re right, it’s not spicy, although really flavorful. I love spicy, though, so I’d really enjoy all of those dishes that give you distress! Good recipe, fun post – thanks. I guess I’ve totally missed the fact that you can’t deal with spicy. Hey – if your body doesn’t like something, it doesn’t like it! Regardless of the chile, you sure know how to spice things up. The list of spice in this recipe has my nostrils going wild. I bet this dish smells as good as it taste! I cannot deal with spicy too because my stomach cannot take it every time I eat spicy food. It’s so unfortunate because a lot of great and delicious foods are meant to eat spicy (in many Asian countries, too). My Indian friend make non-spicy Indian food for me and I’m so grateful… 🙂 This looks great! 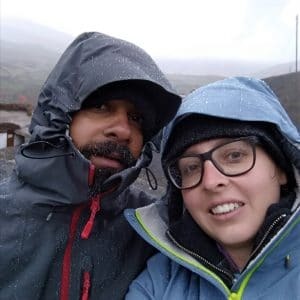 Oh Helene, that looks so good, and I actually licked my lips as I was reading your taste experience with the Muttar Paneer, one of our favourites. I’m wondering if you will post a recipe for the Chapati. I posted about making my own paneer and Naan, I hope you can pop by and check it out. I had posted a recipe for naan previously, but the one above is MUCH better and so easy. I highly recommend it. A few followers have made it with success too. I do hope you can try it and let me know what you think. Yum! I am still working on building up my heat tolerance. Paneer is a favorite of mine. I would love to try this! 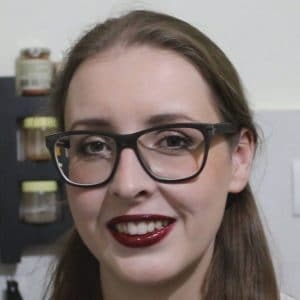 I laughed way too hard – totally feel you on wariness for impending spice assault – I cannot handle things that are too in my face and result in water chugging haha. Love the look and sound of this delicious Matar Paneer recipe! It’s just sometimes, too much is too much. I do love spicy, but that has a different meaning to everyone! Sometimes a “hot” spicy won’t phase me at all while a “mild” will have me on fire. I love Indian food and this Matar Paneer screams my name. I never tried to make Paneer dish before but I will give it a try! This looks delicious and the addition of kasuri methi must be giving amazing flavours. Hi, this may be interesting you: Matar Paneer Recipe Restaurant Style & Nut Free - How to make Mutter Paneer!